Mastering a new skill comes in stages, and can be done in one of two ways. The student can start out following ‘recipes’, repeating what others have done in the past, and eventually, hopefully, after many years have a feel for the why and not just the how. Alternatively, the student can learn the why first. This class takes the latter approach. 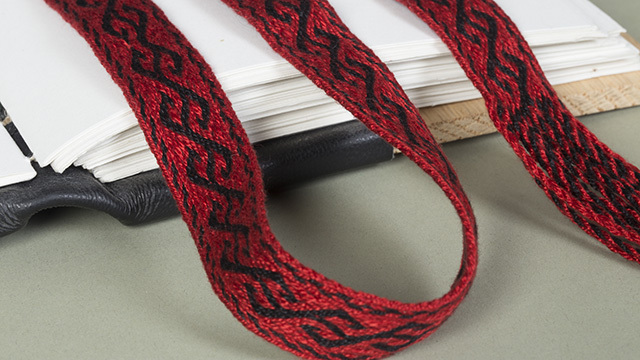 This class will ground you in the mastery of the different variables that affect tablet weaving designs, will help you anticipate which thread will be expressed (and in which direction) in the woven band. It will make you a weaver independent of following patterns, free to design and weave your own ideas. As a beginner, I think that this is a great class. There were many problems which I encountered on my first practice band which were discussed in this class and explained. The art makes much more sense after viewing the class. Thank you!! Lots of must-know info, but sorely lacks video of actual weaving. Just a picture of a sold color band showing angles of threads. Would have been much more informative to see the weaver demonstrating the different chapters while explaining. Didn't need the shots of two people writing notes in a 57 minute video. Excellent class (with bonus cat)! Clear descriptions, superb visual support, very well paced presentation. I like this approach vs the recipe-style, although I'll have to watch again with practice in between. A fine resource!